Supports a local HDMI display. 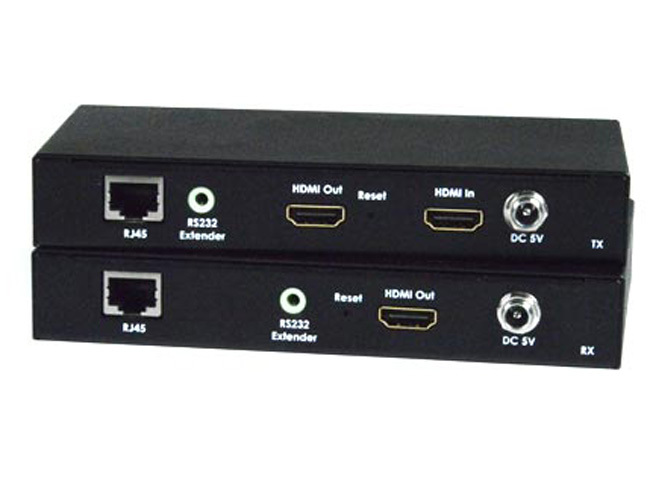 NTI ST-IPHD-IR-L-LC-CLR HDMI Over Gigabit IP Extender Clearance with IR and RS232s transmits digital HDMI signal, IR, and RS232 to one or more receivers up to 328 feet away over a 1000Base-T Gigabit Network connected with CAT5e/6 cable. 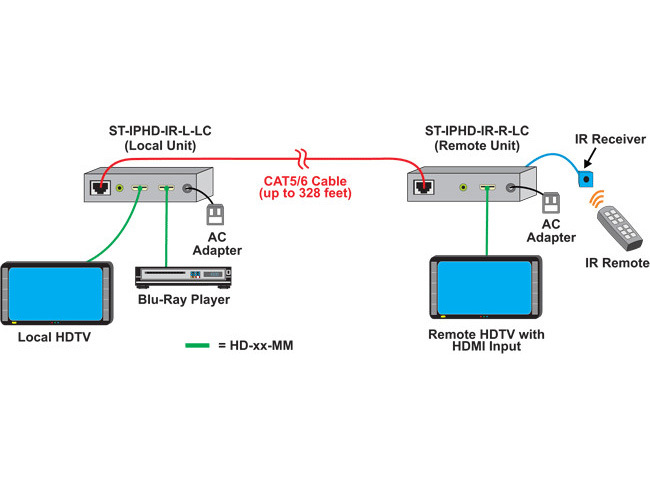 Each HDMI Over Gigabit IP Extender consists of a local unit that connects to an HDMI source, and a remote unit that connects to an HDMI display. The local and remote units can be connected together for a Point-to-Point connection via CATx or a Point-to-Many connection via a network switch. Support for multiple transmitters requires a managed network switch. Supports a maximum of 64 transmitters. Cascade managed network switches up to 3 levels, allowing the farthest display to be located up to 1,000 feet away from the source device. Each receiver can be located up to 328 feet away. Configure the DIP switch on a transmitter and use the included IR remote control to select the source to be displayed from the receiver. LED Display on remote unit identifies which source device channel the receiver is set to display. It is not recommended to use any other network devices on this standalone network as it may cause degradation in performance. Supports 2-way RS232 commands at baud rate 2400 (control software on a PC, or other automated control system hardware such as Control4 or Crestron) to control any devices attached to the matrix using RS232. Why not buy this NTI ST-IPHD-IR-L-LC-CLR HDMI Over Gigabit IP Extender Clearance with IR and RS232 today? One female HDMI connector for source connection. One female HDMI connector for local HDTV display. One female 3.5mm jack for bidirectional RS2332. 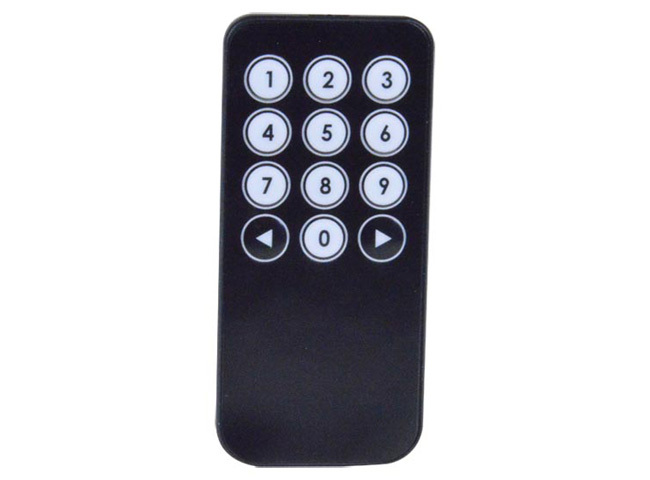 Six DIP Switches for linking the transmitters to the receivers in a Point-to-Many or Many-to-Many configuration. Video Bandwidth: 150 Mbps via LAN. One female HDMI connector for HDTV or computer display. One female 3.5mm jack for IR receiver (included). IR frequency range: 30 kHz to 50 kHz. Local unit WxDxH (in): 6.10x3.11x0.98 (155x79x25 mm). Remote unit WxDxH (in): 6.10x3.99x0.98 (155x101.5x25 mm). Storage temperature: -4 to 140˚F (-20 to 60˚C). Operating/storage relative humidity: 10 to 85% non-condensing RH. 328 feet in a Point-to-Point connection. 656 feet in a Point-to-Point, Point-to-Many or Many to-Many connection via a network switch. Use with cascaded network switches to extend up to 1,000 feet. The max length between the switch and the local/remote unit is 328 feet. 3.5mm to DB9 RS232 cable included with transmitter and receiver. IR receiver and remote control included with receiver.